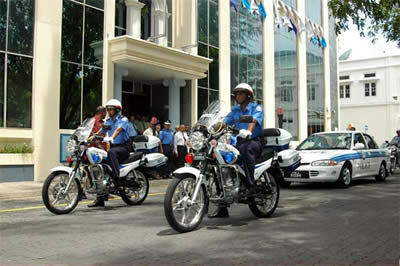 The history of civilian police in the Maldives goes back a long time. In the glorious pre-Islamic period an office called Fithunaayaka (later called Fennaa) existed. The Fithunaayaka was the Chief Constable. Until the 1940s, civilian police constables were called Bandeyri-beykalun. A uniformed police unit called Fuluhun, under the Ministry of the Interior, was first established in the late 1940s but was later transferred within the jurisdiction of the Department of Public Safety and merged with the National Security Service. Traditionally the power of arrest was vested in the Minister of the Interior (later called the Minister of Home Affairs) and was devolved to the Avarhuverin (Municipal Ward Chiefs) of Malé and the Atoluverin (Atoll Chiefs) of the atolls. The office of the Malé Avarhuverin was abolished in the 1950s and the power of arrest was passed on to the Municipal Council of Malé. The Municipal Council was abolished in the early 1960s and the power of arrest in Malé became vested in the Minister of Home Affairs and gradually transferred to the National Security Service. In time, the power of arrest of the Minister of Home Affairs became an anachronism which existed only on paper and exercised in practice by the Minister of Public Safety. One of a series of laws passed on the day the Maldives reverted to a republic specifically delegated the power of arrest to three separate authorities. Archbishop Desmond Tutu once remarked about a change of Presidents in South Africa. "We had P.W. before and now we have F.W." At that time the Apartheid regime in its death throes was desperately trying to project a civilised image to the World. It was hoped that F.W. de Clerk, who replaced P.W Botha, would provide a human face to a vilified system. Tutu was implying that de Clerk was just old wine in a new bottle. The Maldives Police Service, which was previously administered by the Ministry of Defence and National Security as a paramilitary unit has become a civil authority and is now administered by the Ministry of Home Affairs. This was announced at a ceremonial function on the 1st of September 2004. Interestingly, there is no specific legislation in the Maldives such as the Police and Criminal Evidence Act 1984 (UK), the Police Act 1958 (NZ), the Australian Federal Police Act 1979 (Cth), or the Royal Canadian Mounted Police Act that gives the Maldives Police Service the power of arrest, search and seizure. This section effectively provides that the Ministry of Defence and National Security has the power of arrest anywhere in the country, whereas the jurisdiction of the Ministry of Home Affairs and the Ministry of Atolls Development (in terms of power of arrest) is restricted to the capital, Malé, and the atolls respectively. When the Ministry of Defence and National Security administered the Police Service, police officers were acting as delegates of the Minister of Defence and National Security and therefore had the power of arrest anywhere in the Maldives. Following the change of administration of the Police Service from the Ministry of Defence and National Security to the Ministry of Home Affairs on the 1st of September 2004, the police officers now act under the delegation of the Minister of Home Affairs. Since the Ministry of Home Affairs does not have jurisdiction (in terms of power of arrest) in the atolls, the police officers now do not have power of arrest in the atolls.If a police officer arrests a person in an atoll without a written warrant from the Ministry of Atolls Development or a court of law, the officer will be acting ultra vires. If a police officer is required to arrest someone in an atoll, the officer has to act under the delegation of the Minister of Atolls Development because that is the only civil authority that has power of arrest in the atolls under current legislation. As police officers are not employed by the Ministry of Atolls Development and do not have the delegation to perform functions of that ministry, any officer required to make an arrest in an atoll will have to obtain a written warrant from the Ministry of Atolls Development or a court of law. If a police officer arrests a person in an atoll without a written warrant from the Ministry of Atolls Development or a court of law, the officer will be acting ultra vires. The officer will have to be suspended from all duties and the offence will have to be investigated by a competent complaints authority. The officer’s actions should also be subject to judicial review by the High Court.